If you're searching for a casual yet stylish look, try teaming a dark brown shearling jacket with blue flare jeans. Both items are totally comfy and will look fabulous paired together. Got bored with this look? Enter Yeezy snake effect calf boots to switch things up. If you're looking for a casual yet absolutely chic look, marry a brown shearling jacket with blue jeans. Both items are totally comfy and will look fabulous paired together. A pair of Yeezy snake effect calf boots will add some real flair to this outfit. If you're in search of a casual yet chic outfit, choose a white coat and blue ripped skinny jeans. Both items are totally comfy and will look fabulous together. 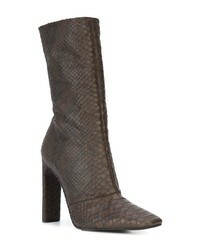 Opt for a pair of Yeezy snake effect calf boots from farfetch.com to instantly up the chic factor of any outfit. If you're in search of a casual yet chic getup, consider pairing a black fringe leather open jacket with a tan button skirt. Both garments are totally comfy and will look fabulous paired together. 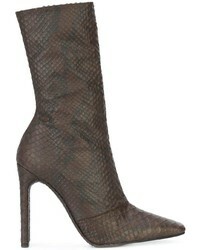 Opt for a pair of Yeezy snake effect calf boots from farfetch.com to va-va-voom your outfit. If you don't like trying-too-hard combos, wear a grey sweater dress. Round off with brown snake leather ankle boots and off you go looking stunning. 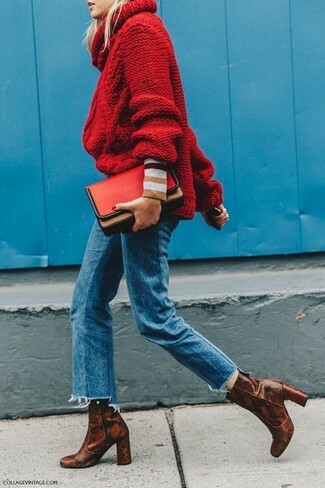 If you're after a casual yet absolutely chic ensemble, choose a red knit turtleneck and blue jeans. Both garments are totally comfy and will look fabulous together. Amp up the cool of your getup by completing it with brown snake leather ankle boots. If you're scouting for a casual yet chic ensemble, consider wearing a blue denim shirt and a white pleated mini skirt. Both pieces are totally comfy and will look fabulous together. Up the ante of your getup with brown snake leather ankle boots.